Eleven different species of sea bird can commonly be found in the state of Connecticut, from the huge magnificent frigatebird to the diminutive dovekie. Although they're most often spotted around coastal areas, some of these species will venture further inland. However, you'd be best off heading to coastal Connecticut if you want to catch a glimpse of these birds. Two pelican species reside in Connecticut: brown pelicans (Pelecanus occidentalis) and American white pelicans (P. erythrorhynchos). 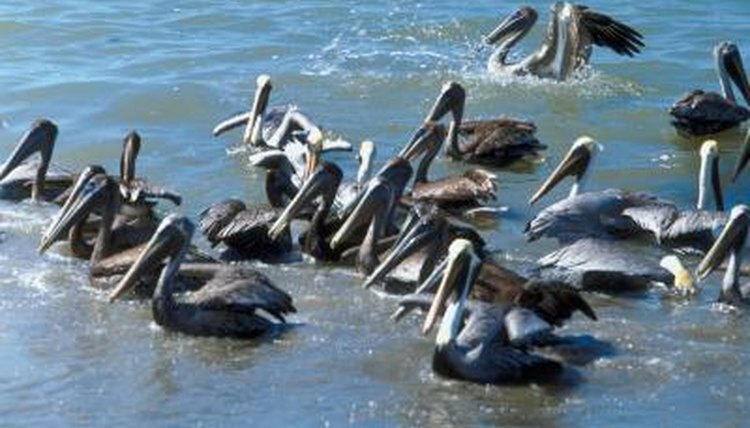 Measuring up to 54 inches long with a wingspan of roughly 79 inches, and weighing up to 11 pounds, brown pelicans are the smaller of the two species. American white pelicans can be up to 65 inches long with a wingspan of 114 inches, and they can weigh up to 20 pounds. Both species are usually found living on coastal bays or estuaries. Measuring roughly 36 inches long with a wingspan of up to 84 inches, magnificent frigatebirds (Fregata magnificens) truly are magnificent to behold. While the majority of their bodies are black, females have white throats and males have red throats, which they can inflate to attract mates during breeding season. These birds can only be found in Connecticut outside of breeding season, as they nest in tropical mangrove swamps. They use their long, hooked bills to help them catch the crustaceans, small fish, jellyfish and squid that make up their diet. With their bold black and white plumage and their brightly colored beaks, puffins are one of the world's most iconic sea birds. Only one puffin species can be found in Connecticut: the Atlantic puffin (Fratercula arctica). Although they spend much of their lives at sea, they flock to coastal areas in the spring and summer to breed. They're most often seen on cliff tops, where they like to build their nests. While they're excellent swimmers, they're surprisingly swift in the air, and can reach speeds of up to 55 miles per hour. Seven more species of sea bird can be found living in Connecticut. These are the northern gannet (Morus bassarius), the razorbill (Alca torda), the black guillemot (Capphus grylle), the dovekie (Alle alle), the Audubon's Shearwater (Puffinus lherminieri), the glaucous gull (Larus hyperboreus) and the thick-billed murre (Uria lomvia). Some of these species live in the state all year, while others only come to breed or overwinter.